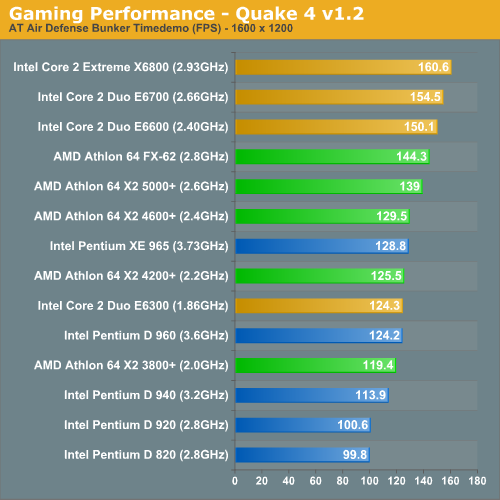 The performance advantage in Quake 4 starts off high, but not astronomical for the Core 2 processors. The Core 2 Extreme X6800 is just over 11% faster than the Athlon 64 FX-62, mainly because we're looking at it in a more GPU bound light than we have in the past. Regardless, it is a performance advantage and far better than the older days of NetBurst chips where Intel's best could barely keep up with AMD. The Core 2 Extreme X6800 now attains a 19% performance lead over the FX-62, and the E6600 manages a 10.9% advantage itself. 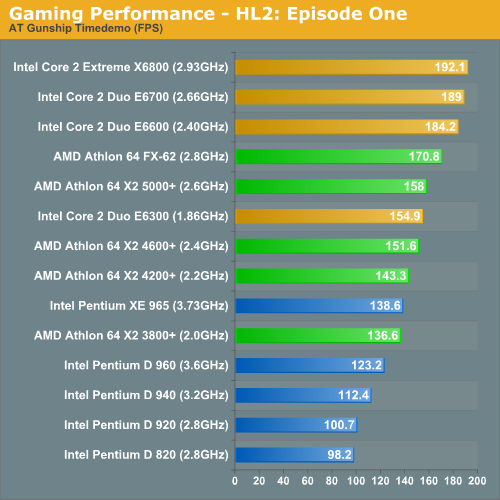 Half Life 2: Episode 1 provided us with numbers closer to what we saw with Quake 4, the performance advantage here is just over 12% for the X6800 over the FX-62. With a couple of speed bumps, AMD could equal Intel's gaming performance here. But the real issue for AMD is the fact that the E6600 priced at $316, is able to outperform the FX-62 at over twice the price. The E6300 continues to provide a great value but isn't nearly as impressive as the rest of the Core 2 line.